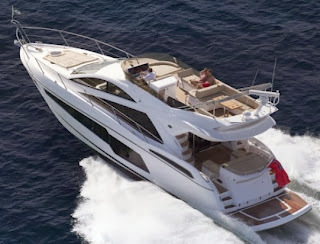 This latest Sunseeker 55 Manhattan has seen an interesting model development which started as the 50 a decade ago. The 55 Manhattan is the fourth version taking over the 53. Versus the 53 it replaces the 55 Manhattan features a larger flybridge, new latest signature very large Sunseeker hull windows, and a versatile interior. One of the options the 55 Manhattan has an offer on order is for the galley up on the raised part of the main deck to port side of the helm station, or below as standard. The accommodation plan of the 55 Manhattan offers three large cabins; with a full beam owners stateroom amidships. A crew cabin with single berth and a shower head is located to aft. Power is twin 800hp engines.